Trailhead and parking area are on Rt. 16 in Green's Grant, NH (summit is in Bean's Purchase). The parking area is on the east side of the road, 6.8 miles south of Rt. 16's eastern junction with Rt. 2 and 12.8 miles north of its northern junction with Rt. 16A. This very long but mostly moderate loop allows peakbaggers to hit the summits of both Carter Dome and South Carter Mountain. Although these two peaks both provide limited views, you will also climb over the summit of Mt. Hight, which provides hikers with the finest views in the Carter Range. On the way up, you will visit Carter Notch, a sharp mountain pass filled with ponds, cliffs, and boulders as well as an AMC hut. For hikers who aren't interested in climbing the 4000-footers, see the separate hikes Mt. Hight and Carter Lakes. Leave the parking area on Nineteen-Mile Brook Trail and immediately begin following the brook on a wide dirt path, climbing gradually. After a short stretch close to the brook, the trail begins to pull away. After crossing a bridge over a tributary, it soon heads back and continues easily along the bank, passing an open area above a small waterslide. It again follows the brook closely except through a relocation which heads up and over a small knoll to bypass storm damage. Several more cascades are passed in this section. At just over one mile from the parking area, the trail crosses another tributary on a larger, recently built bridge, then leads back to Nineteen-Mile Brook, where it passes a cement dam. From here, it continues along the brook, but at a greater distance, gradually splitting off. In 0.7 miles from the dam, pass Carter Dome Trail on the left. The trail then crosses two more brooks on small bridges and ascends steadily through the forest, now far from the brook. After a mile of easy climbing, it crosses one last small brook, then climbs a stone staircase, after which the terrain becomes rockier. Another half mile of climbing leads to Carter Notch, where Wildcat Ridge Trail goes to the right and the trail joins the Appalachian Trail. Having crossed its highest point, the trail now descends 100 feet to Upper Carter Lake, where several openings on the shore provide amazing views across the water to the cliffs of Wildcat Mountain. At the far end of this pond, Carter-Moriah Trail, along with the Appalachian Trail, goes to the left to climb Carter Dome. Continue along the trail to the north shore of Lower Carter Lake, where you can look across to the boulder field known as The Rampart. Further down, another nice sitting spot has views up to the cliffs of Carter Dome, on the opposite side of the notch. The Carter Notch Hut and the end of the trail are just a short distance beyond this. To begin the climb out of the notch, return to the junction with Carter-Moriah Trail and continue hiking on that. The trail climbs moderately, soon becoming very steep. Rock steps aid the ascent in the steepest places. In 0.3 miles from the Nineteen-Mile Brook Trail, follow a side path to the right out to a viewpoint ledge. From here, there is a good view over the Wildcat River valley to the mountains around Conway, but the most spectacular part of this view is the straight drop down to Carter Notch. The Carter Lakes are seen in the tiny valley to the east of the notch, below the imposing cliffs of Wildcat. You can also see the Carter Notch Hut. To the far left, an odd-shaped boulder known as Pulpit Rock protrudes from the mountainside, hanging above the great boulder field which descends to The Rampart. Looking back toward the trail, the Northern Presidentials rise above the trees. Just beyond this side path, the grade eases significantly as the trail climbs steadily up the ridge toward Carter Dome. A few flat areas break up the constant climbing, which goes on for 0.9 miles. The woods become open near the top and the trail runs almost flat into a small clearing with a large cairn. The trail then turns right and continues into a much larger clearing at the summit of Carter Dome. Near the cement footings from a former fire tower is a junction with Rainbow Trail. At the other end of the clearing, look to the left for a small view to the north, which overlooks Middle Carter, Mt. Moriah, and the Mahoosuc Range beyond. You can also see to the distant Pliny and Pilot Ranges to the northeast, above little, rocky Pine Mountain. Continue on the Carter-Moriah Trail and descend gently along the summit plateau. In 0.1 miles, look for a path on the left which leads to a better viewpoint. From here, you can now see Mt. Washington and the Northern Presidentials, as well as all of the view seen from the last viewpoint. Continue along the pretty sub-alpine path, then drop into a taller forest for another 0.3 miles. Pass Black Angel Trail on the right, then, quickly after, bear right to stay On Carter-Moriah Trail as Carter Dome Trail continues straight. After a final, quick descent, the trail begins an easy, 125-foot climb to the alpine summit of Mt. Hight. Mt. 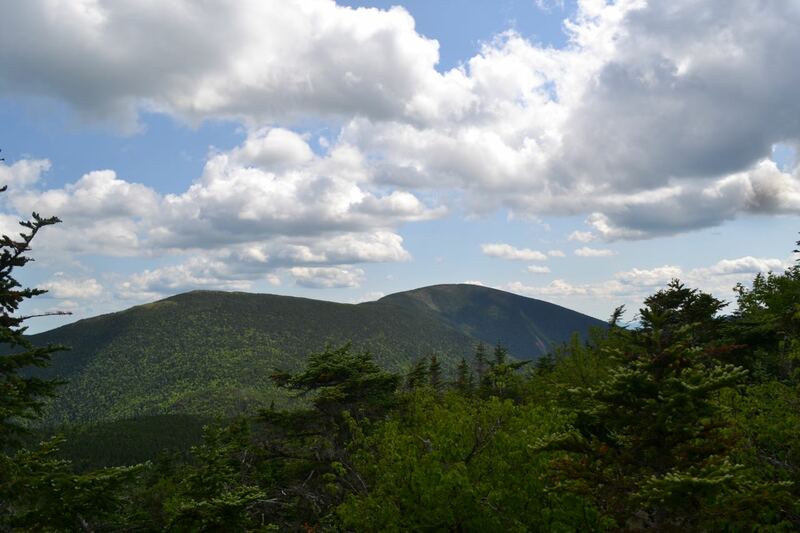 Hight's summit provides hikers with spectacular views in all directions, including a great look across the notch at the lofty Northern Presidentials, views north and south along the Carter-Moriah Range (which Mt. Hight is a part of), and an expansive vista over the Wild River Wilderness. To the southwest rises nearby Carter Dome. To the right, far in the distance, is Mt. Hancock, with Wildcat Mountain below and next to Carter Dome. To the west are the Presidentials: Boott Spur, Mt. Washington, Mt. Jefferson, Mt. Adams, and Mt. Madison. The Great Gulf opens up below Mt. Adams. To the northwest are the Pliny and Pilot Ranges, with the Crescent Range below. To the north along the range are South and Middle Carter Mountains, with many distant mountains in the Great North Woods, Maine, and Canada above. Off to the right of Middle Carter and far below are the ledge-spotted Mt. Moriah and Shelburne Moriah, with the Mahoosuc Range beyond. To the northeast are the distant high peaks of Maine, and just further over are the mountains around Evans Notch: Caribou Mountain, Royce Mountain, and Speckled Mountain. To the east is the Baldface Range, from low Mt. Meader up to the two rounded domes of the Baldfaces. Next over from South Baldface is Eastman Mountain, which peeks out from the col between South Baldface and Sable Mountain. Above is the long ridge of Maine's Pleasant Mountain. To the right of Sable Mountain is Chandler Mountain. To the southeast are the lower hills centered around the distinctive Kearsarge North. Doublehead Mountain is in front, with Black Mountain even closer. To the south is Moat Mountain, with the Ossipee Range behind and the eastern Sandwich Range, including Mts. Chocorua and Paugus. The rest of the Sandwich Range is hidden behind Carter Dome. Continue on the Carter-Moriah Trail, which makes a sharp left turn on the summit, then scrambles down steeply alongside a ledge back into the forest. The trail descends rapidly with rocky footing for 0.4 miles, then joins Carter Dome Trail (turn right) for an easy 0.2 mile walk to the Zeta Pass Trail junction, where Carter Dome Trail goes left. This is your descent route. For the side trip to South Carter, continue straight, staying on Carter-Moriah Trail. The trail drops into the true Zeta Pass, then begins the ascent. In the lower part of the climb, the trail crosses several wet areas on bog bridges. As it climbs higher, it stays to the west side of the ridge crest. The final climb to the summit is somewhat steep and rocky and involves one stone staircase. A few feet before the summit, look for a path on the right which leads out to South Carter's only viewpoint. The view is very limited, but does allow you to look back at Mt. Hight and Carter Dome. You can also see part of the Baldface Range. The summit is just past this viewpoint, on the left side of the trail. It is marked by a small cairn and is 0.8 miles from Zeta Pass. Return to the Zeta Pass Trail junction the way you came and head down Carter Dome Trail. This trail descends moderately and soon begins switchbacks. Look for glimpses through the trees up to Carter Dome. After quite a long way, you will hear a brook in the valley below. The trail crosses this brook 1.1 miles from Zeta Pass, below a small cascade and pool. The trail becomes much easier, and inn 0.3 miles, it crosses back to the other side. It then heads through a few grassy sections, reaching Nineteen-Mile Brook Trail in another half mile.